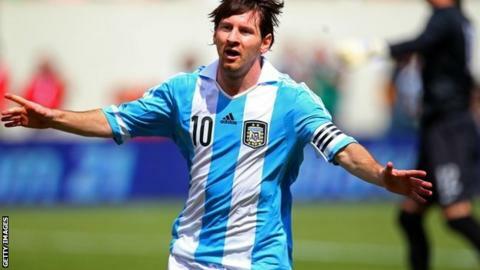 Barcelona forward Lionel Messi scored a hat-trick for Argentina in an ill-tempered 4-3 victory against Brazil. Romulo opened the scoring for Brazil, before Messi's well-taken double within the space of three minutes. Oscar equalised from close range in the second half and Chelsea target Hulk put Brazil in front once again. Federico Fernandes restored parity and Messi struck the winner with five minutes left. Ezequiel Lavezzi and Marcelo were both dismissed late on. The entertaining match was played in front of 82,000 fans at the Meadowlands Stadium in New York, home of American football teams the Giants and the Jets. And supporters were treated to a fantastic performance from Messi, who has now scored 82 goals in an incredible season which has seen the player break numerous goalscoring records. His hat-trick against Grenada for Barcelona in March meant he became the Catalan outfit's highest ever goalscorer, beating a 60-year record held by Cesar Rodriguez. And he went past Gerd Muller's 39-year European record for goals in a season by netting another treble against Malaga in May. The Samba Boys were given the perfect start when Vasco da Gama's Romulo scored his first international goal with the opposition defenders appealing for offside in vain. Messi calmly slotted home the equaliser after Real Madrid striker Gonzalo Higuain had robbed Tottenham's Sandro of possession. And the 24-year-old netted again soon after when he brilliantly rounded Brazil goalkeeper Rafael Cabral and slotted home. Oscar drew level for Mano Menezes's men, also his first goal for his country, and Chelsea supporters would have been excited to see transfer target Hulk take advantage of a fumble from Argentina goalkeeper Sergio Romero. Alejandro Sabella's side hit back through Fernandez, who headed home a corner, and Messi completed the victory with a jinking run and strike from the edge of the area. The match boiled over in injury time with a scuffle breaking out, which saw Argentina forward Lavezzi and Brazil left-back Marcelo both dismissed for an altercation.